The 5G Articulating Keyboard Arm Mechanism from Humanscale is the heavier duty precursor to the current 6G Arm. 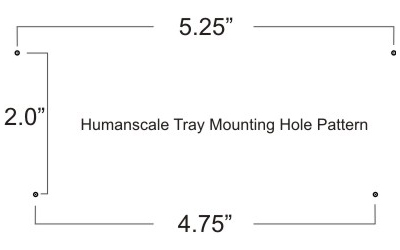 It provides a reasonable amount of height adjustability from 5.00" below to 1.25" above the mounting point. The 0° to 15° dial-a-tilt feature allows the user to set the tray at any desired negative inclination in that range. It includes a 22" or 27" steel track with plastic glides (not ball-bearings) for storage when the tray is not in use. Note: The 5G Keyboard Arm Mechanism can only accept Humanscale Keyboard trays. 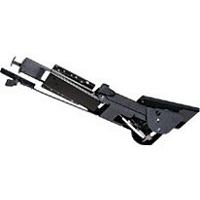 If you are unsure of what type of keyboard tray you already have or are willing to consider alternative ball-bearing arms with longer durability and superior range consider the Ovation Low Profile Leverless Arm. Keyboard Arm: 7019-NM-7000. Click here for keyboard arm and tray specifications. NOTE: Each accessory requires a Track Mount: Part Number 8328 (Prices shown at right include a single track mount for each accessory). 8335-MD-104 CPU Holder. Includes Mount for CPU Holder. 8335-LG-104 CPU Holder. Includes Mount for CPU Holder. 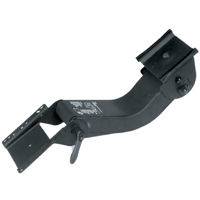 This arm offers separate lever activated controls for height and tilt. It features a low profile design allowing for more clearance for the legs and knees. 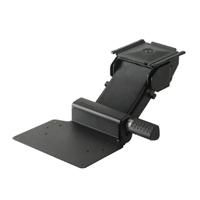 The standard 360° swivel is available for side to side movement and a 23" storage track ensures that when not in use the arm and tray are fully stored. Instead of the Lift and Lock feature for height adjustment, a spring brake finger touch paddle actuator is used to adjust the arm to the desired height, and a simple T-Pull release is used to tilt the platform to the desired angle. Accepts all standard trays. 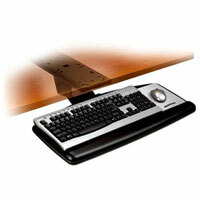 The Adjustable Keyboard Arm and Tray by 3M mounts on the underside of your desk using screws. The height and tilt of the arm are adjustable using one knob. It comes with a gel-filled wrist rest and a battery saving mousing surface. The wrist rest is removable, and adheres to the tray using the 3M Dual Lock Attachment System, and has a leatherette cover. The mousing surface is also removable, and is self-adhering to the tray. 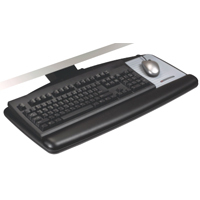 The Adjustable Keyboard Tray by 3M is height and tilt adjustable. Just flip the lever to adjust height, and pull the tab to adjust tilt. The track is 22" long, and uses screws to mount to the desk. It features a built-in leatherette wrist rest which is easier to clean than other wrist rests, and lasts longer. It comes with a 3M Precise™ Optical Mousing Surface, which can be placed to the right or left of the keyboard. This version of the Momentum Arm swivels in two locations. The 'elbow' can swivel 45° to either left or right, while the 'shoulder'(where it mounts to the underside of the track) will rotate the usual full 360°. 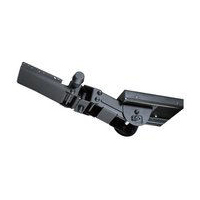 This makes this unit ideal for corner applications, or any workstation where an 'off-centre' mount of your keyboard arm is required (e.g. no suitable mounting in the ideal location). Using the dual swivel capabilities it is possible to position the tray up to 5.5" to either the left or right of the track mounting point. 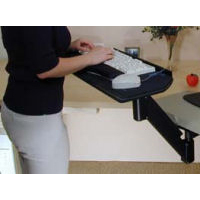 The 23" storage track lets you get the arm out of your way when not in use. It has the Lift and Lock height adjustment, and a soft touch knob to tilt the platform to the desired angle. Accepts all standard trays. Knobless, leverless height adjustment from 9" below to 13" above the mounting point - adjusts with ease for use in sitting or standing positions. The hydro cylinder floats the arm for adjustment and automatically resists movement when positioned in place, allowing normal, light-force keyboard typing without drifting lower (the keyboard arm will NOT fully support weight of typing arm or support wrists at rest). Double-articulating mechanism allows lateral movement of keyboard tray. Unlimited negative or positive tilt on keyboard tray. Allows 360° rotation at 2 pivot points, 22" (or 28") ball bearing track, track mounting area 23" (or 29") x 7". Any standard keyboard tray mounts easily to arm. 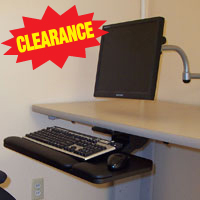 The ClickIt-Basic from SmartMotion Technology features a heavy-duty steel track mechanism to achieve both height and angle adjustment so users are able to position the keyboard at the optimum height and angle necessary to achieve a neutral arm and wrist posture. The MDF tray is 26" wide x 11" deep and is capable of providing sufficient space for most full-size keyboards and most mice. As this is only a 17" track the tray will not fully recess below the desk. When stored the tray will project by 3-4 inches. Note: The Keyboard and Mouse Palm Supports shown are NOT INCLUDED. The wire Mouse Guard shown is also not available. This latest Sit-Stand Arm from Waterloo is an improved keyboard arm (replacing the old 7659D23 model) with increased height range from 8.25" above track to 5.88" below track. 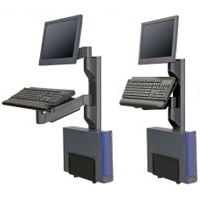 The reduced neck length allows users to be closer to the desk in seated and standing positions and also allows for full storage with most keyboard trays on a 21.75" track instead of 23". The new design has increased stability and improved accuracy of tilt position, along with a redesigned Lift-N-Lock mechanism for easy adjustments to height of keyboard tray.